On September 29, 2012, Voice of San Diego helds its second annual Politifest event in Liberty Station. The event was a blend of spirited political exchange, street fair-esque community booths, food, fun for the kiddies…and this being San Diego, a beer garden sponsored by Stone Brewing Co and Public Policy Strategies. The event also included a series of talks about San Diego called “City 101”, designed to give people a quick snapshot of issues in our city. To lighten things up, they asked me to do one about San Diego craft beer. I decided to post the presentation with additional commentary below each slide. 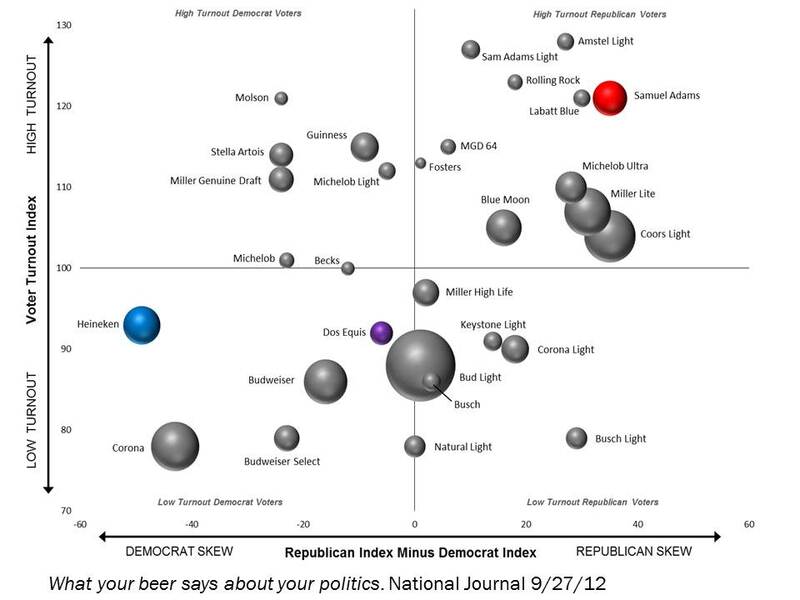 To find out what the Craft Beer Debates are, click here. 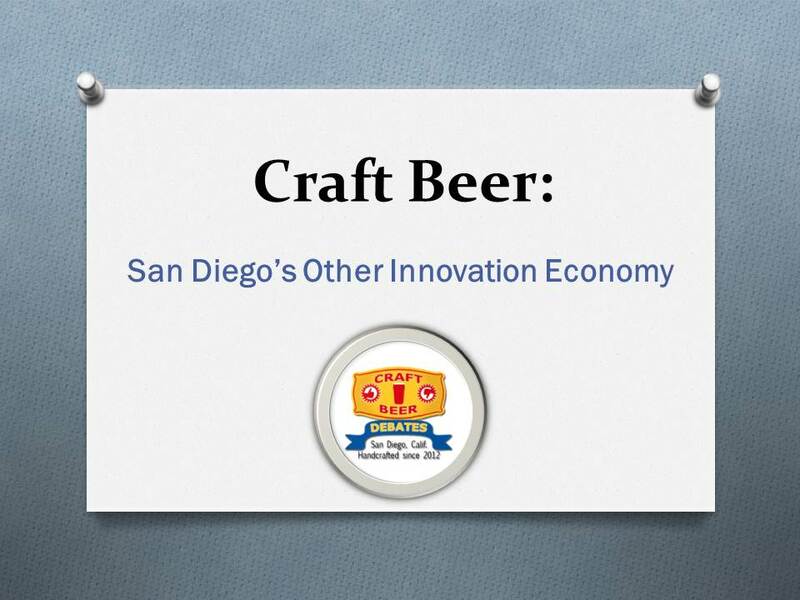 The title of the presentation is a recognition that Craft Beer in San Diego is not just about enjoying quality refreshment, it’s an innovative economic engine. Cities from Portland to Austin to Asheville are experiencing explosions in the popularity and creativity of their craft beer cultures. 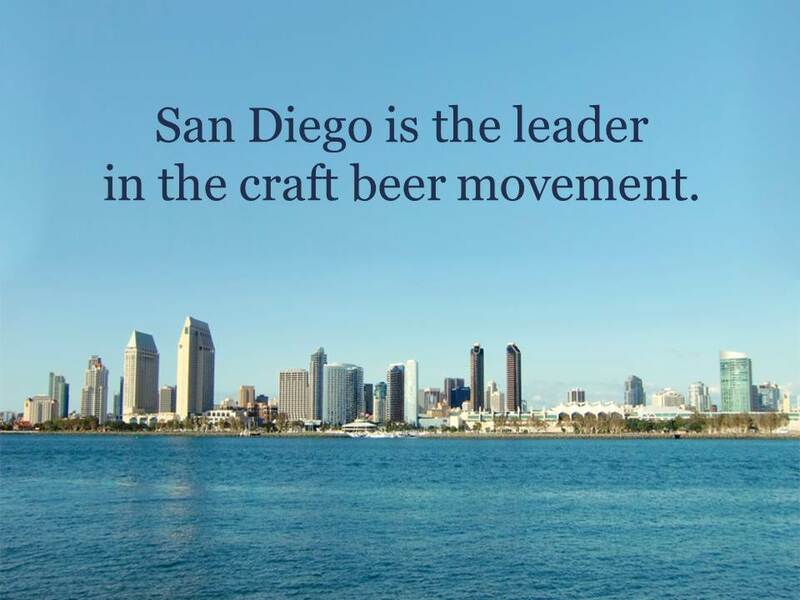 San Diego has become a national and international leader in the craft beer movement. 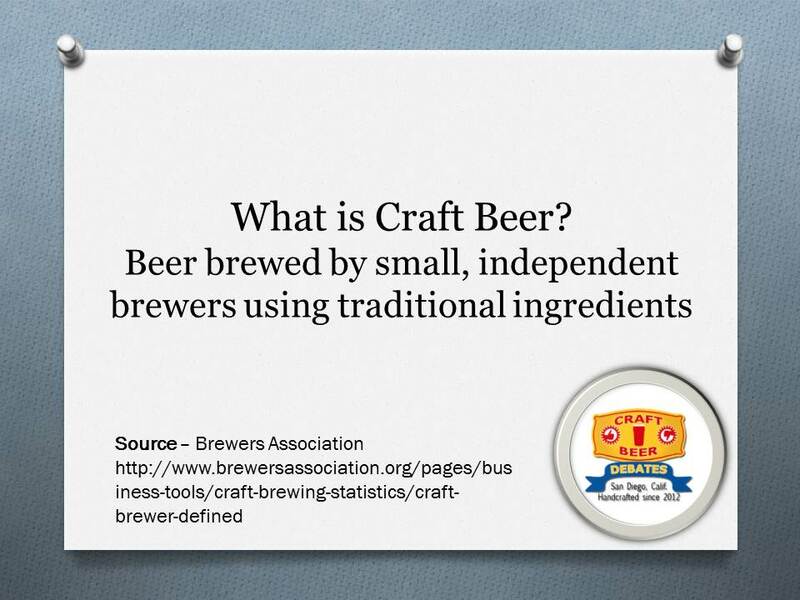 I took this definition from the Brewers’ Association. There was some debate after the discussion whether “traditional” was a fair way to characterize craft brewers. On the one hand, not using cheap alternatives to traditional barley malts to mass produce flavorless product tends toward the traditional. On the other hand, many craft brewers are defined by their creative use of non-traditional spices and fruits and flavor profiles to make unique beer. Many of these can be found in a handy download on the San Diego Brewers’ Guild website here. 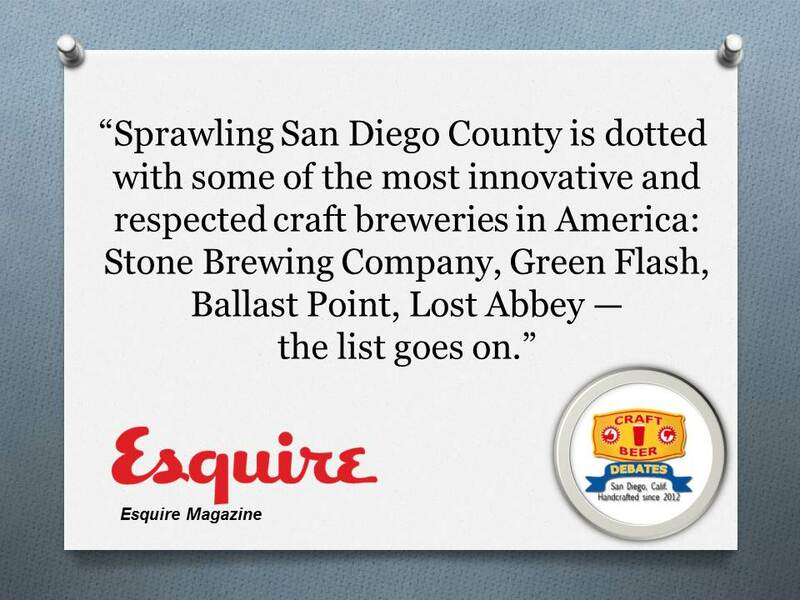 In addition to this quote from Esquire, Mens Journal has named San Diego America’s best beer city. 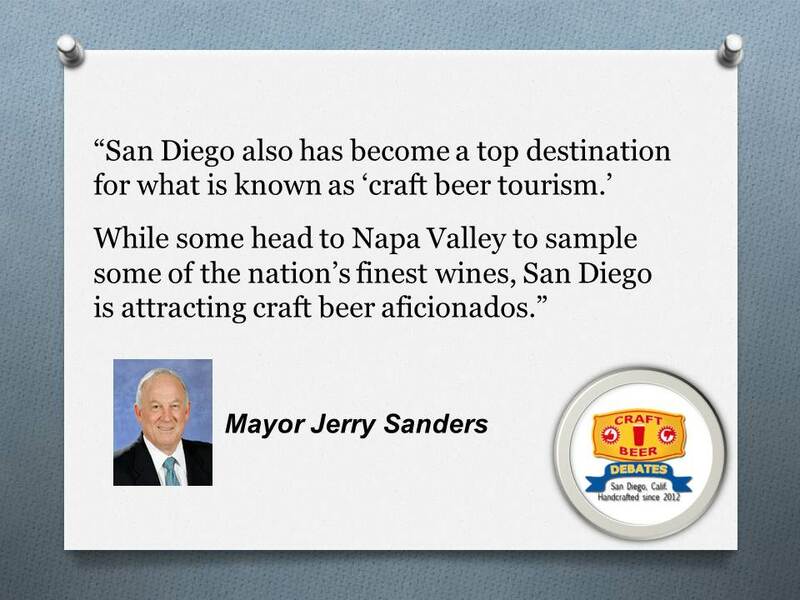 I referred to Mayor Sanders in the presentation as San Diego’s patron saint of San Diego craft beer. His leadership for the industry–especially creating a friendly business environment for local brewers and tasting rooms–is a big reason for its recent growth. 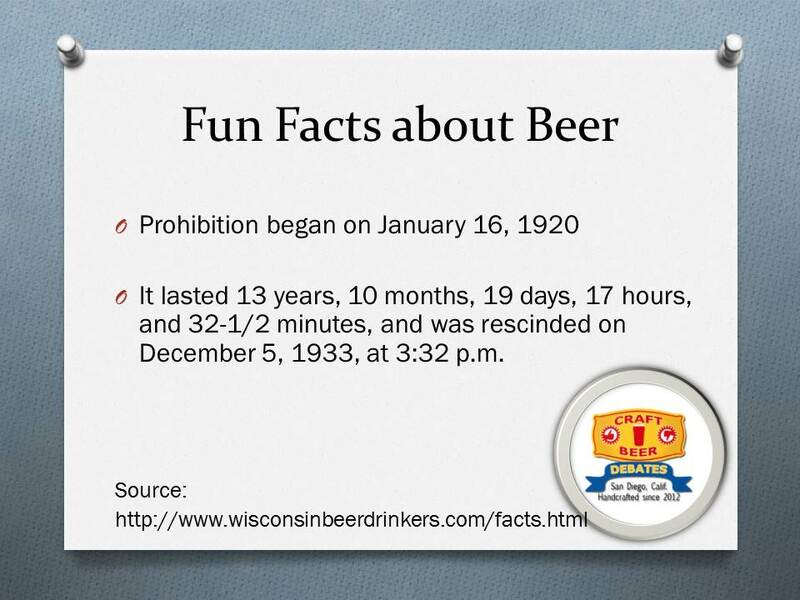 This fun fact highlights the end of prohibition. – December 5th, FYI. 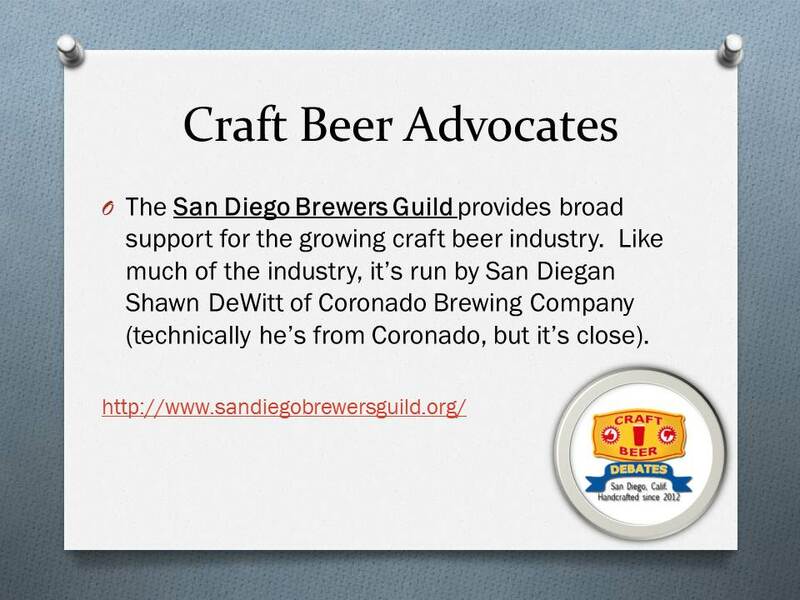 The San Diego Brewers’ Guild is a passionate group committed to helping the industry grow in the right ways. Unlike many industries in many cities, San Diego’s craft brewers have a spirit of collaboration that recognizes the old adage that “a rising tide lifts all boats.” Attributed to John F. Kennedy, his speechwriter Ted Sorensen wrote the saying actually originated from the New England Council (a chamber of commerce in New England). Don’t picture 20-something college students going crazy. 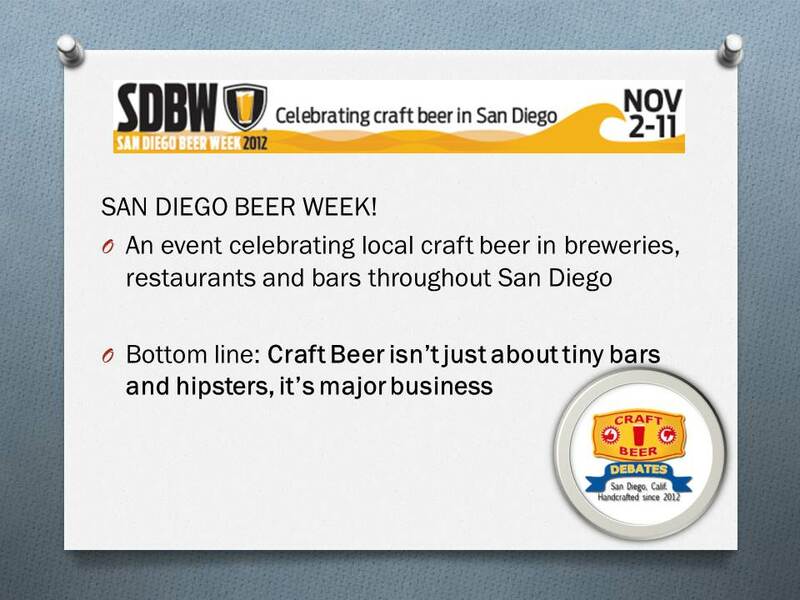 San Diego Beer Week is an enormous display of great craft beer, local, high-quality food, and several well-planned events around San Diego. Get details here. Realize that unlike summer tourism events, this November series is a major draw at a time when people aren’t coming to San Diego for vacation already. It also brings economic activity to San Diego’s neighborhoods, rather than concentrating it in one part of the city. This fun fact speaks for itself – happy to supply you with a nice tidbit for trivia night! 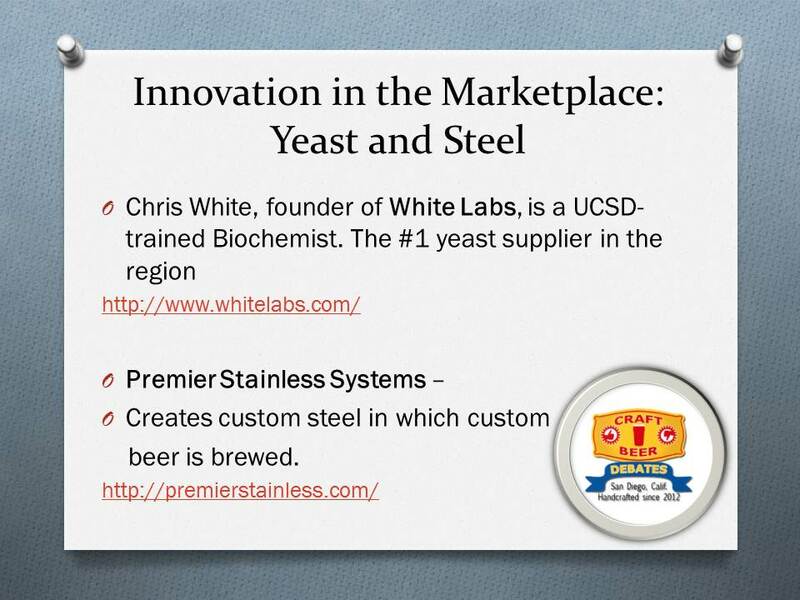 The industry also combines innovation in other aspects of the marketplace, including UCSD-trained biochemist Chris White (founder of White Labs, which has a cool tasting room) and one of the major suppliers of custom steel, Premier Stainless Systems. 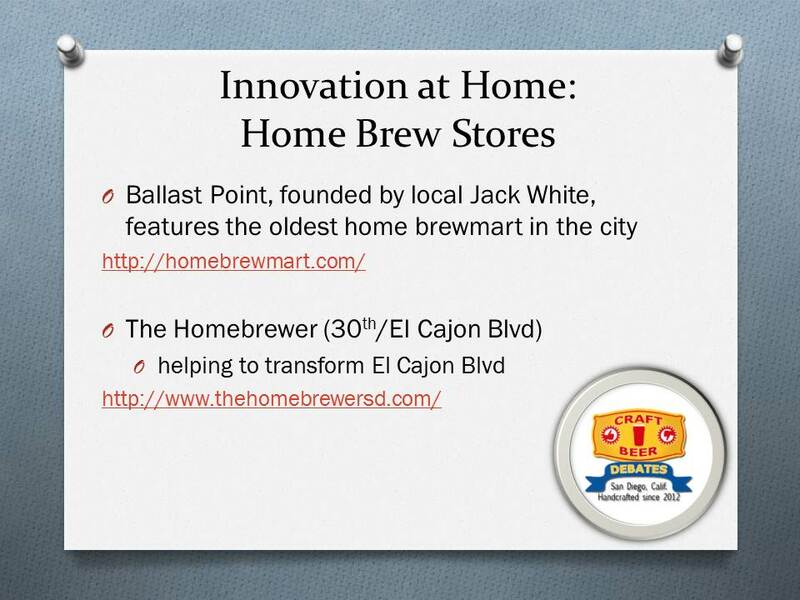 A big part of the innovation is driven by home brewing. 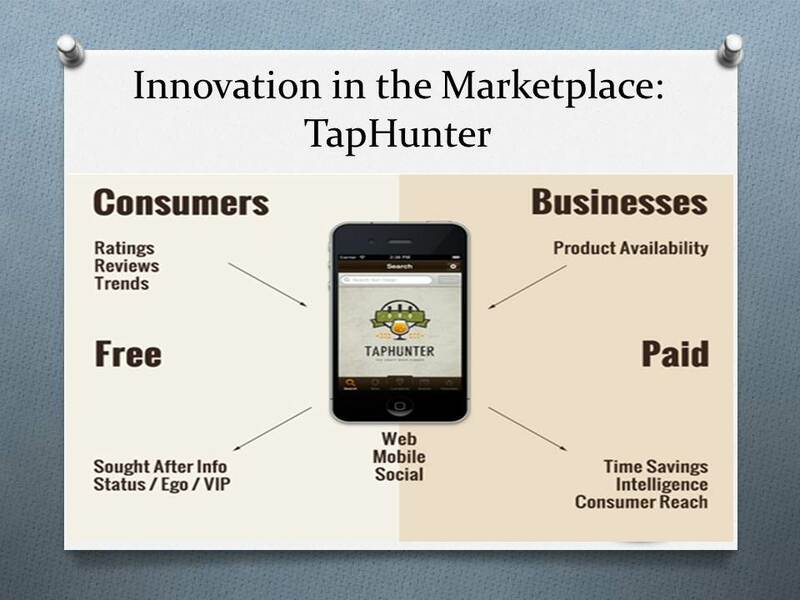 Not just because of the creative exploration in beer, but the importance of the stores themselves. The Homebrewer on El Cajon Blvd is actually helping transform this part of the city. 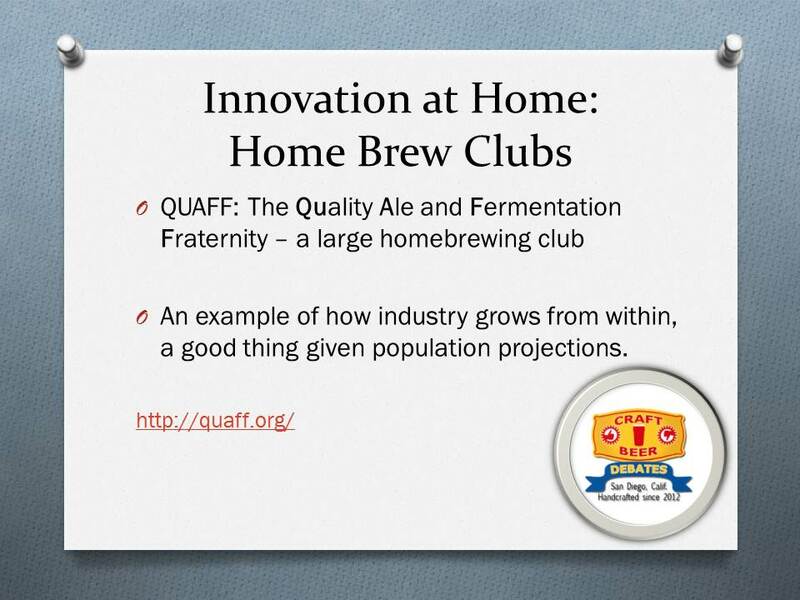 The industry also generates innovation in brewing through the exchanges of home brew clubs like QUAFF. 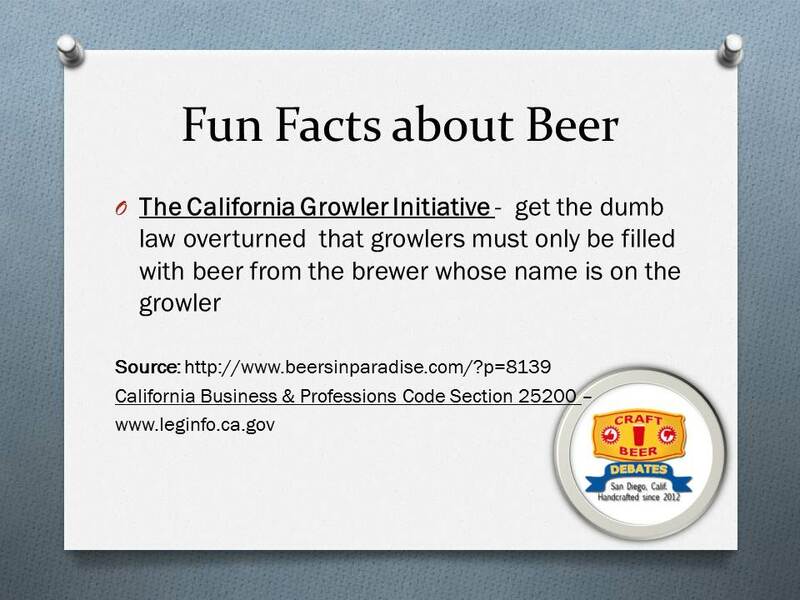 This slide also produced a bit of controversy, as there is some dispute about what the law related to growler fills actually allows. I’ll be doing some additional research to see how ABC and the courts have decided on these issues in the coming weeks. 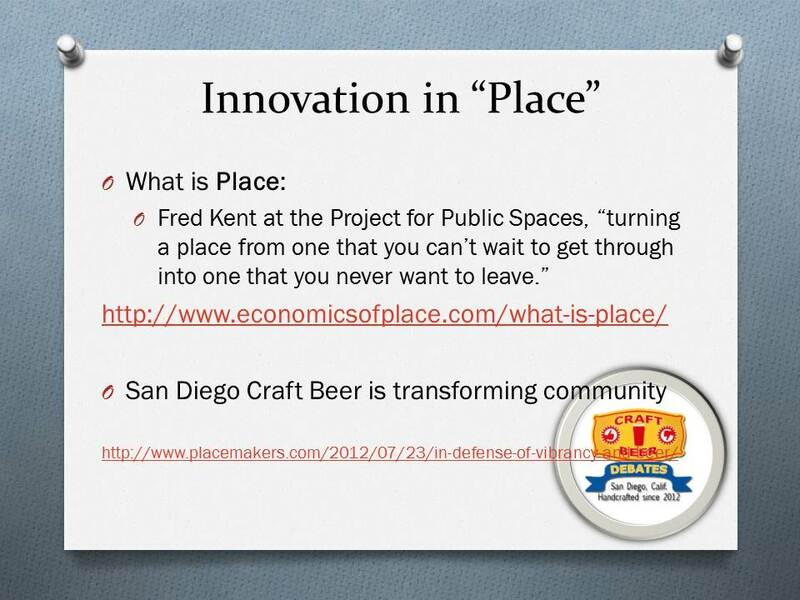 One of the most important innovations for communities in San Diego is craft beer’s innovation in “Place.” This is, at its core, about changing the way we experience the environment in which we live, work and play. Here’s a great article about this concept from Placemakers. The independent businesses along 30th Street in North Park and South Park are innovating in “place” by encouraging change. Growth in bike culture, supported by local restaurants and shops, is being driven in large part by the craft beer revolution in this community. 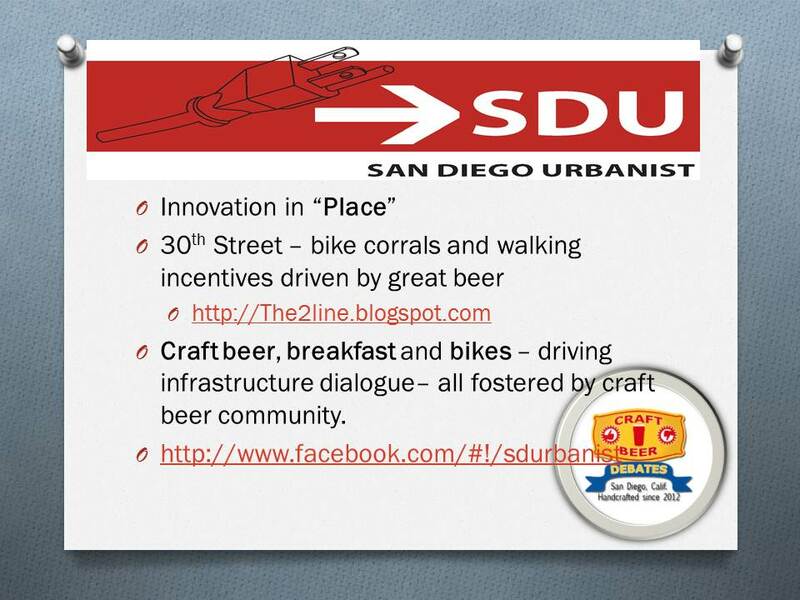 The San Diego Tactical Urbanists were born out of a similar spirit. Many local pubs and microbreweries are innovating in community by creating spaces that are family-friendly and open as meeting places for neighborhood activism. Much the way Harvey Milk’s store became a focal point for civil rights in the Castro in San Francisco, bars such as The Whistle Stop, URBN and Blind Lady Ale House are creating similar energy. 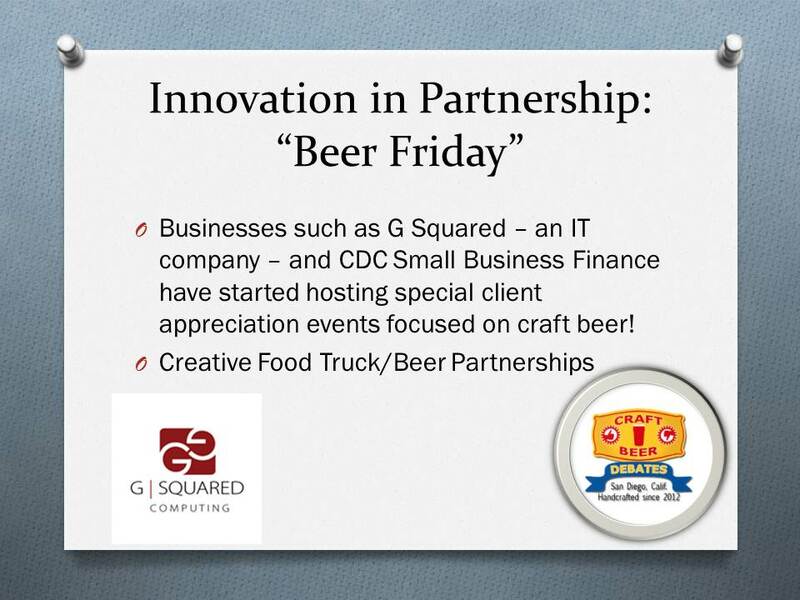 Businesses around San Diego, such as one of its leading IT Infrastructure companies G Squared Computing, are coming up with creative ways to support craft beer and expose more people to the industry. This clever slide was printed in the National Journal Online. Too bad they didn’t do one for craft beer. 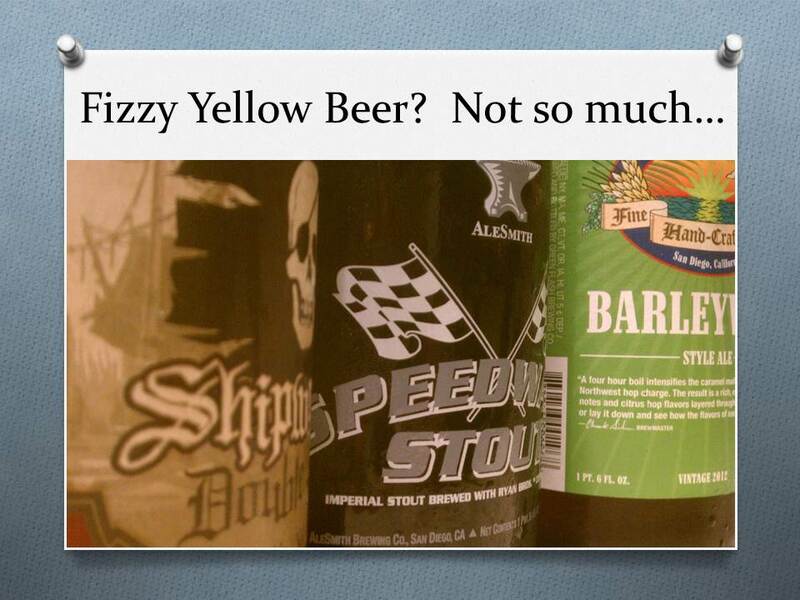 And one final slide, photos of three local craft beers I enjoyed the night before with friends. This was a fun project and Politifest was a great, family-friendly event. The news they produce is supported by members, so please consider signing up–what’s $100/year for good journalism? I’d like to shamelessly plug Hess Brewing and Societe Brewing Co, two of my favorite local craft breweries. Really good quality beer coming out of both places. Craft beer in San Diego, and the community it fosters, is creating real economic opportunities in neighborhoods and becoming a catalyst for all sorts of important change. If you have any questions or want to be connected to any aspect of the craft beer community, just email me. I’m happy to help foster as many good connections as I can.